Careers take-off and fly high in AXN Beyond’s jam-packed line-up of new shows this February! Feel the passion, adventure and espionage at 30,000 feet in PAN AM, a new drama series set in the 1960s, when Pan American World Airways led the energy and excitement of the Jet Age. In their individual quests for adventure, the “Pan Am” crew of pilots and stewardesses face both opportunity and peril, as they juggle their lives, loves, hopes and dreams while flying around the world to glamorous international cities like Paris, Berlin, Jakarta and Monte Carlo. Fasten your seat belts as the season premieres on February 11, 2012, airing every Saturday at 9:50 p.m., first and exclusively on AXN Beyond. Join psychotherapist Dr. Dani Santino as she balances her workload and the new demands of single motherhood in the drama series NECESSARY ROUGHNESS. When Dani’s perfect world begins to unravel after her husband’s infidelity, she becomes the most sought-after therapist, with high-profile clients from athletes to entertainers and politicians clamoring for her unique brand of therapy. Watch Dani tackle all her and her patient’s issues beginning February 1, 2012, airing every Wednesday at 10:55 PM. Patti Stranger is back as she moves her matchmaking service to New York City inMILLIONAIRE MATCHMAKER SEASON 4. This season, Patti uses a few new tricks including a spy camera, lie detector test and hiring a make-up specialist from Saturday Night Live. From Wall Street to beach bum, this season also introduces the most over-the-top and challenging millionaires yet including Judith Regan, editor, producer, publisher and TV and radio show host, Freddie Mitchell, ex-wide receiver for the Philadelphia Eagles, and Albie and Chris Manzo, the sons of Caroline from The Real Housewives of New Jersey. Watch Patti and her staff help their millionaire clients find love in the city that never sleeps beginning February 13, 2011, airing weeknights at 10:05 PM. Meanwhile, a dream team of 18 past cheftestants are back and ready for redemption in TOP CHEF SEASON 8. This season, the Primetime Emmy Award-winning reality contest returns to New York City with host Padma Lakshmi and head judge chef Tom Colicchio, alongside judges Gail Simmons and new this season, best-selling author and chef, Anthony Bourdain. 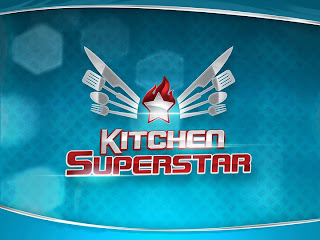 Don’t miss out on all the culinary action beginning February 29, 2012, airing weeknights at 10:05 PM. Catch these all new programs and more on AXN Beyond this January: SkyCable (Channel 35), Dream Satellite (Channel 36) and Cignal Digital TV (Channel 37). 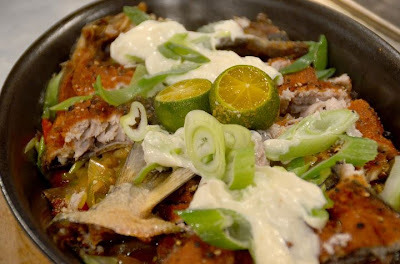 Here's Idol sa Kusina Recipe for Episode 30 / Jan. 29- BANGUS SISIG. 1. Sauté onion, garlic, chili, red and green bell peppers then add chunks of crispy fried bangus. Add chicken stock, liquid seasoning, Worcestershire sauce and calamansi juice. 2. Off heat, toss bangus with Mayonnaise. 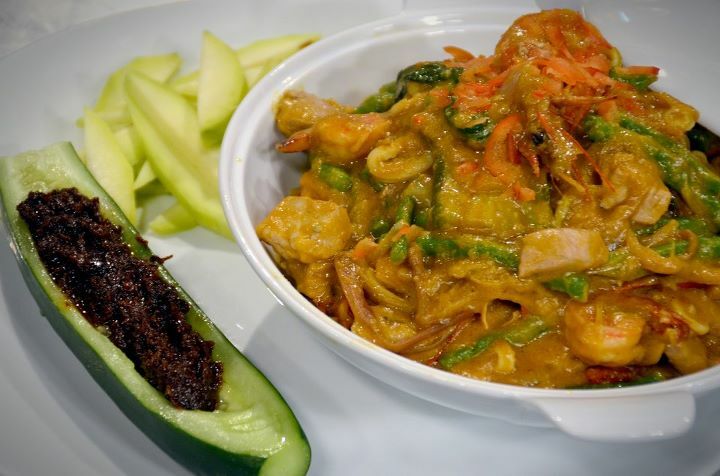 Here's Idol sa Kusina Recipe for Episode 30 / Jan.29-SEAFOOD KARE-KARE. 1. Boil the seafood stock then add annatto oil, peanut butter, giniling na sinangag na bigas. Stir quickly until thick. Set aside. 2. Sauté onion, garlic, tuna, prawns and squid in annatto oil for 2 minutes, you may add all vegetables. Add kare-kare sauce and season with salt. 3. 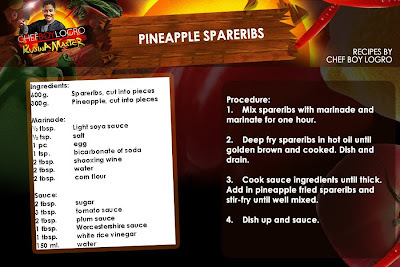 Place in pot and serve with slices of green mango and bagoong. 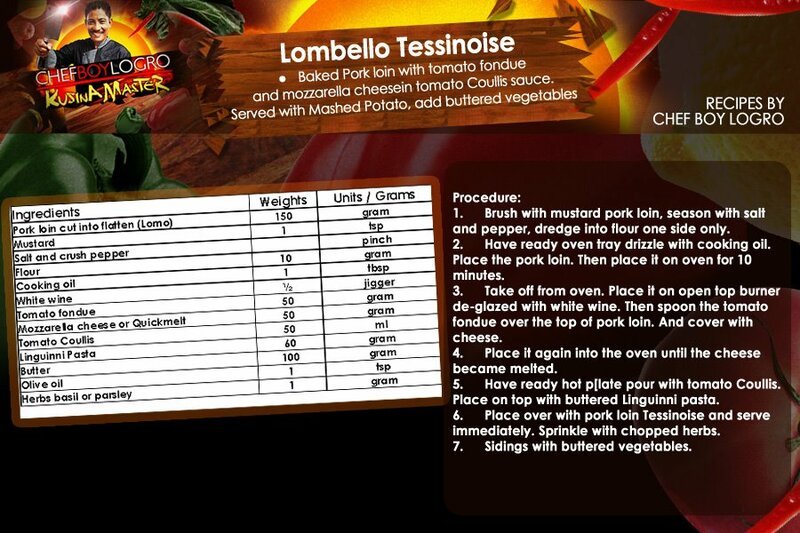 Here's Idol sa Kusina recipe for Episode 30 / Jan. 29- MARINATED ROAST PORK LOMO WITH MASHED YELLOW PUMPKIN. 1. Marinate lomo in garlic puree, onion, olive oil, mustard, rosemary leaves, salt and pepper for 1 hour. Pan sear in griddle for 2 minutes then place in oven until done. 2. Boil pumpkin until soft then mashed, and mix into pan. Add butter, milk, salt and pepper. 3. Have ready plate then bed with mashed pumpkin. Top with slices of lomo then serve hot. One of the best TGI Friday’s bartenders, Ram has made a name for himself in the local, regional and international bartending scene. He was the Philippine representative at 2009 WBC held at the T.G.I. Friday's Worldwide Headquarters in Carrollton, Texas and won 2nd place. From TGI Friday’s Malate, Ram bested contenders from local Friday’s branches and defeated the best bartenders from Asia, bringing home the Asian Bartendixng Tilt in Malaysia. His eyes are now set on the world bartending crown happening on February 26, 2012. Now, the country’s pride needs your support. Help Ram bring home the “Favorite Bartender Award”. Check out http://www.worldbtc.com/finalists and vote for Sir Raminad “Ram” Ong. Voting is until February 22, 2012. You can only vote for one person per day. 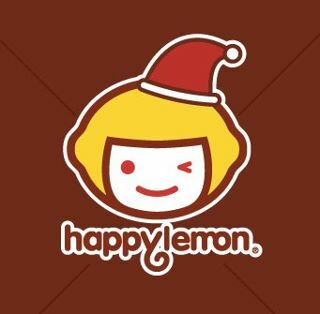 Happy Lemon Philippines Open for Franchising? There are a few Happy Lemon branches already here in the Philippines. Happy Lemon is The World's Yummiest Drinks! People are going crazy over milk tea! With its wide variety of flavors, tea lovers keep on coming back for more! 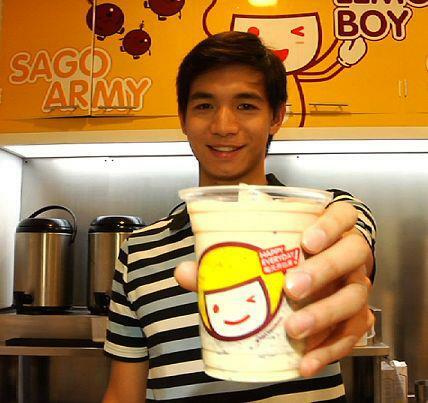 And with the more than a dozen of Milk Tea businesses sprouting everywhere, one can't help but wonder if Milk Teas are here to stay or is it just like any other food craze? Many believe that drinking shark's fin soup is an effective way to heal arthritis and other ailments that is why there is a large demand for it in different Chinese restaurants. But a recent campaign to stop the rampant killing of sharks called for awareness on the importance of preserving this specie. And big restaurants are also heeding this call. Watch out Kapuso Mo Jessica Soho on Januray 28, as Shark's Fin Soup will be featured in the said episode. Milk Tea will be featured in Kapuso Mo Jessica Soho on January 28, 2012. Download to Scan, Watch, and Win a Sharp Washing Machine from Ariel 3D! The P&G Virtual Quest is a mobile augmented reality application that allows users to participate in an exciting raffle simply by interacting with logo of Ariel 3D Stainlift and other variants. To join, the participant must download the P&G Virtual Quest application from the Android Market and scan the Ariel 3D Stainlift logo found in Ariel packs and materials. Upon scanning the logo, a video will appear inside the application. The user must tap the screen to discover a “unique code”. The user will be prompted to submit the code along with his personal information, specifically his Name, Age, Address, mobile number and email address, in the application in order to qualify for the raffle. 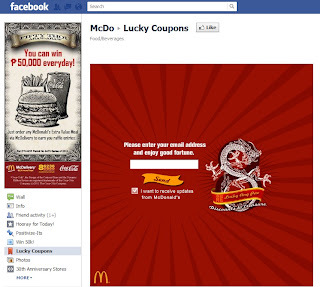 A user can only submit a maximum of five entries in the entire duration of the promo. At the end of the promo period, one lucky winner of a Sharp Washing Machine will be drawn from the pool of entries. The contest runs from December 28, 2011 to February 10, 2012. Open to all Filipino Citizens, legally or by birth, 18 years old and above residing within Philippine territory. 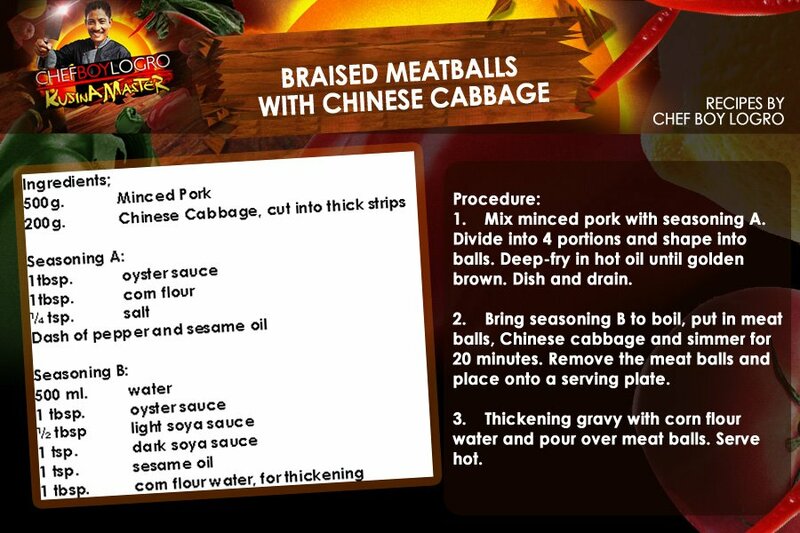 Here's Kusina Master Recipe- Braised Meatballs with Chienes Cabbage. 200g- Chinese cabbage, cut into thick strips. 1. Mix minced pork with Seasoning A. Divide into 4 portions and shape into balls. Deep-fry into hot oil until golden brown. Dish and Drain. 2. Bring Seasoning B to boil, put in meatballs, Chinese cabbage and simmer for 20 minutes. Remove the meatballs and place onto a serving plate. 3. Thickening gravy with corn flour water and pour over meatballs. Serve hot. Here's Kusina Master Recipe- Pineapple Spare Ribs. 1. Mix spare ribs with marinade and marinate for one hour. 2. Deep fry spare ribs in hot oil until golden brown and cooked. Dish and Drain. 3. Cook sauce ingredients until thick. Add in pineapple fried spare ribs and stir-fry until well mixed. 4. Dish up and sauce. 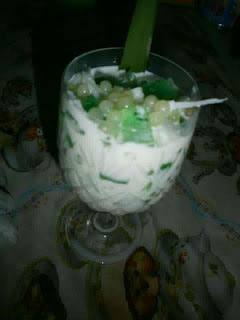 How to make our our favorite dessert 'Buko Pandan'. Here's Kusina Master Recipe- Pan-Fried Chicken Fillet Kai Lan. 1. Mix chicken breast meat with marinade and marinate for 30 minutes. 2. Heat up to 5 tbsp. oil. Pan-fry chicken breast until golden brown. Dish up. 3. Blanch baby Kai Lan in boiling water with 1 teaspoon oil and salt until cooked. Dish up and arrange a serving platter. 4. Cook sauce in clean wok until thick. Add in fried chicken breast meat and stir fry until well mixed. 5. 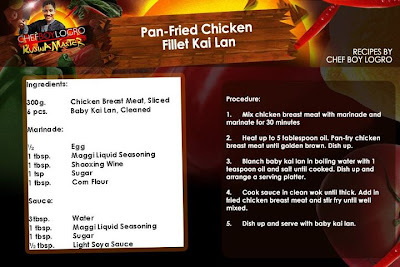 Dish up and serve with babay kai lan. 2012 ushers in success and happiness with the most powerful of the zodiac signs! Enter the Water Dragon! 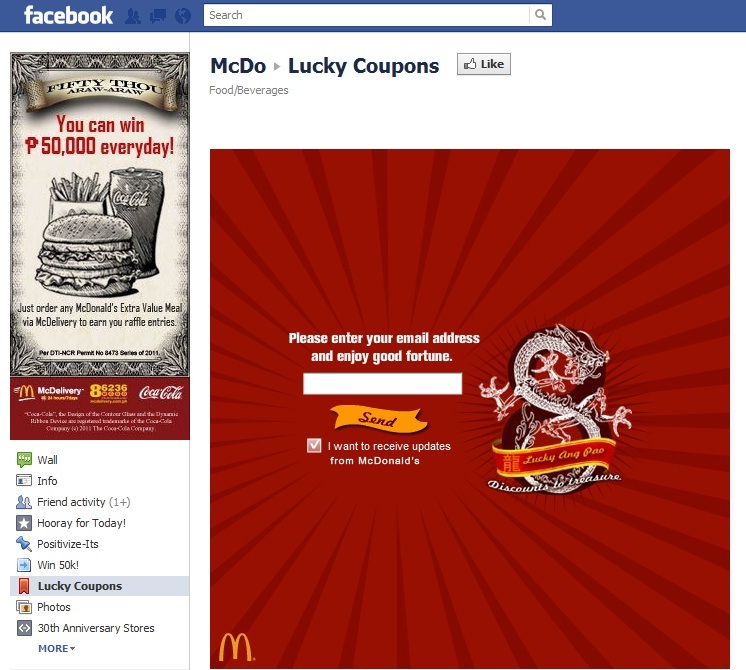 Ride into its good fortune with McDonald's Lucky Ang Paos ! Get good luck now! 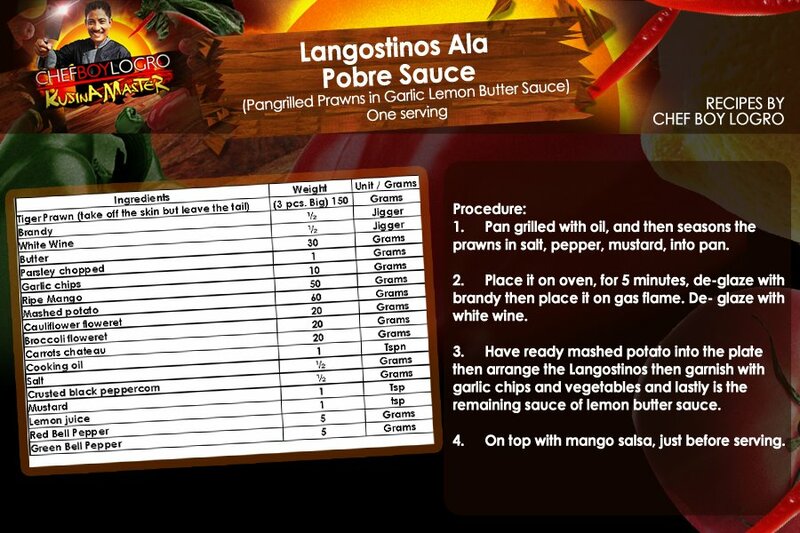 Here's Idol sa Kusina Recipe for Episode 29 / Jan. 22- ALIMANGO ASADO ESPESYAL. 1. Remove shell of alimango, then cut alimango into four pieces, remove aligue; and set aside. 2. Sauté garlic and ginger puree, leeks and tomato, then the alimango and flambé with Chinese wine. Add chicken stock. Cover wok and simmer for 15 minutes or until done. 3. Thicken with dissolved cornstarch and add chopped spring onion. Season to taste. 4. Place on platter and garnish with crispy fried sotanghon on top just before serving. 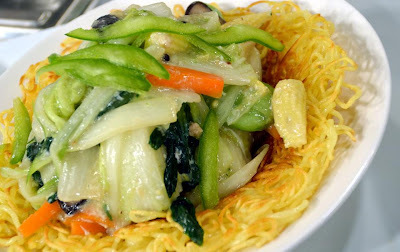 Here's Idol sa Kusina Recipe for Episode 29 / Jan. 22- ROYAL NOODLE NEST WITH VEGGIES. 1. Stir-fry the ginger puree and garlic puree. Flambé with Chinese wine. Add all vegetables. Add chicken stock. Bring to a boil and thicken with cornstarch and, lastly, white egg. Season to taste and set aside. 2. Have ready heated oil in a wok, then place noodles and stir from time to avoid burning noodles. Then turn once, continuously stirring until noodles turn brown. 3. Place on round platter and pour over the top with vegetables. 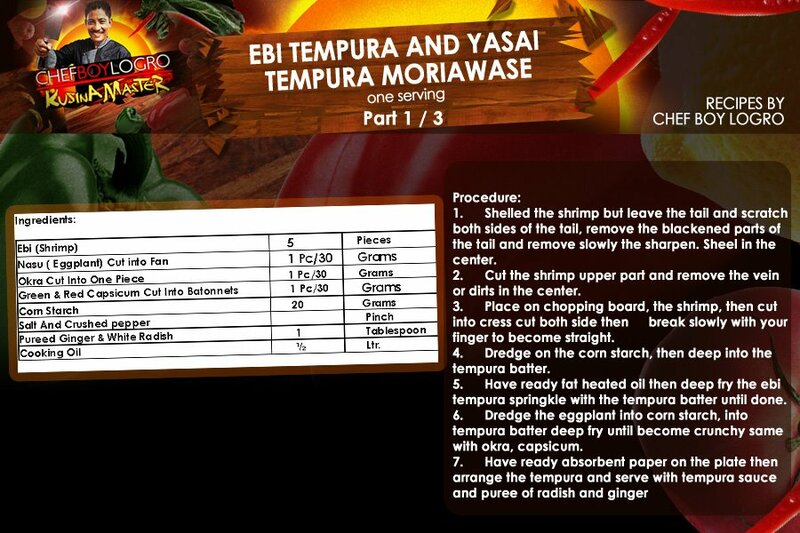 Heres Idol sa Kusina Recipe for January 22 episode- RED EMPEROR's HOT AND SOUR SOUP. Recipe will be posted here after airing on January 22. 1. Trim any fat from pork and slice into shreds about 2 inches long and less than ½ inch thick. 2. Soak mushroom in boiling water until softened. Place pork in large pot with shrimp and stock. 3. Bring to a boil and reduce heat to allow to simmer gently for 4-5 minutes. 4. Add all remaining ingredients except for egg. 5. Add corn starch and water mixture. Cook further for 1-2 minutes over low heat. 6. Remove pan from heat and add egg gradually stirring gently until it forms threads in soup. 7. Mix spoonful of hot soup with cornstarch and water mixture and add to soup, stirring constantly. 8. Bring soup back to simmering point for 1 minute to thicken cornstarch. Serve immediately. 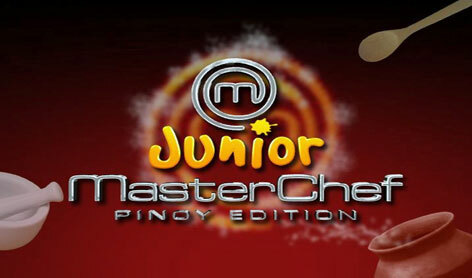 Watch the Junior Masterchef Pinoy Edition Grand Finals coming soon as the top 7 kiddie cooks of the Pinoy Edition of the competitive cooking game show Junior MasterChef were recently named after Emman Buquid was eliminated. They are competing for the title of being the first Pinoy Junior MasterChef, 1-million peso cash, and a culinary scholarship. Junior Masterchef- Pinoy Edition is hosted by Judy Ann Santos-Agoncillo with chef-judges Ferns Aracama, Jayps Anglo, and Lau Laudico. The first-ever Pinoy Junior MasterChef is Kyle Imao from Marikina who garnered a total score of 91.8 points from chef-judges Fern Aracama, Rolando Laudico, and JP Anglo; guest judge Glenda Barretto of Via Mare; and 100 other guest-judges. Kyle took home 1 million pesos and a culinary scholarship worth 1.5 million pesos from Treston International College. Watch Idol sa Kusina Recipe- Chinese New Year 2012 Celebration on January 22. 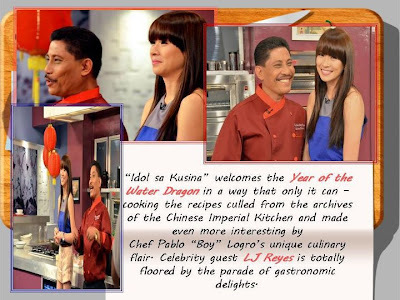 Idol sa Kusina welcomes the Year of the Water Dragon in away that only it can- cooking the recipes culled from the Archives of the Chinese Imperial Kitchen and made even more interesting by Chef Pablo Boy Logro's unique Culinary flair. Celebrity guest LJ Reyes is totally floored by the parade of gastronomic delights. Kapuso Mo Jessica Soho presents: Dimsum Delight. Kung Hei Fat Choi! This Chinese New Year let us taste the different flavors of small but delightful treats such as dimsum and dumplings like Siomai, Xiao Long Bow, and Ha Kao! Here's Kusina Master Recipe- Crispy Fresh Cuttlefish in Sweet and Sour Sauce. 1kg Fresh cuttlefish cut into pieces. 1 tablespoon shredded red chili. 1. Blanch cuttlefish in boiling water for half minute. Dish and drain. 2. Heat-up oil for deep frying, put in fresh cuttlefish and deep-fry until dry and crispy. Dish and drain. 3. Pour sauce into a wok and cook until thick. 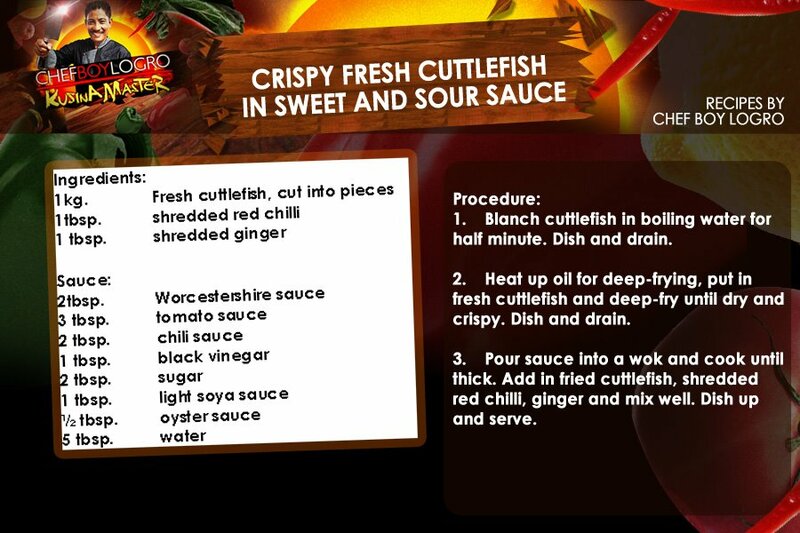 Add in fried cuttlefish, shredded red chilli, ginger and mix well. Dish up and serve. Watch Kusina Master: Jan. 19, 2012 episode as Kusina Master- Chef Boy Logro prepares Mango Kerabu . “Kusina Master” is a 15-minute cooking show in front of live audiences that will unravel the secrets in making everyday foodpreparation fun, easy and exciting. 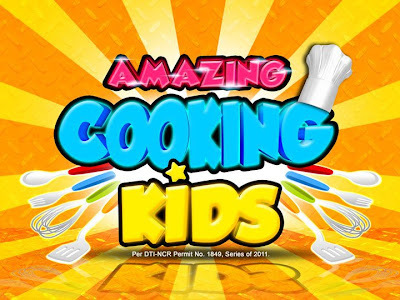 Hosted by Chef Pablo “Boy” Logro, the one and only “Idol sa Kusina,” will guide every viewer to a step-by-step food preparation with practical cooking tips added with special techniques in making everyday dishes with a “wow” factor. Watch ‘The Kitchen Musical’ Finale on Studio 23. Will it be a bitter or sweet ending for Maddie and the rest of the staff of The Avilon? The finale of the pan-Asian musical-cooking TV series topbilled by Karylle andChristian Bautista comes to its exciting second-part finale this Saturday, January 21, in “The Kitchen Musical” on Studio 23. The whole restaurant is in chaos after Mr. Avilon disappeared, with grave allegations being thrown at him. This tears Maddie (Karylle) apart as questions and doubts filled her mind regarding her father’s disappearance. As she searches for answers, Maddie finds out the truth behind her father’s schemes and a shocking revelation about Harry (Arthur Acuna). As if the news about Mr Avilon isn’t enough, Selena (Rosemary Vanderbrouck) then reveals to Maddie and the rest of the kitchen staff that The Avilon will have a new owner with her as the new General Manager. Together with Harry, Alex (Stephen Rahman Hughes) will be kicked out of the restaurant and Daniel (Christian Bautista) re-enters the picture as the new Executive Chef. With The Avilon’s change of ownership, will its staff also undergo a change of heart? Will they take Alex or Daniel’s side? 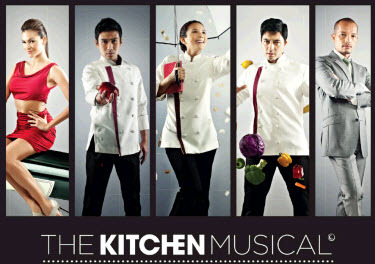 “The Kitchen Musical” first aired in the Philippines, among other Asian countries, in October and premiered via Studio 23. It was shot entirely in Singapore and was produced by The Group Entertainment. This formally catapulted the international careers of Filipino artists Karylle, Christian,Thou Reyes, Arthur Acuna, and Ikey Canoy. To date, “The Kitchen Musical” airs in 16 countries in Asia. TGE recently closed the deals with ABC and Casanova Multimedia, which agreed to do a local version of TKM in US and Italy respectively. The second season of the show is said to be in the works. 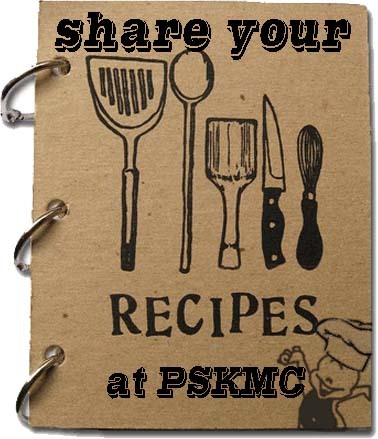 Don’t miss the finale of “The Kitchen Musical,” this Saturday, January 21, 9:30 p.m., on Studio 23. The Kabarkada Network will air a re-run of the series in April. For more information, visit its official Facebook page atwww.thekitchenmusical.com/facebook/ph. Here's Idol sa Kusina Recipe for Episode 27 / Jan. 16- CREAMY POTATO CHICKEN SALAD WITH CARROTS, BEETS AND FRESH HERBS. 1. Combine all ingredients in mixing bowl except the cucumber. 2. Cut cucumber into thin log slices using Mandouline. 3. Bed salad bowl with sliced cucumber and fill with mixture of creamy potato chicken salad. 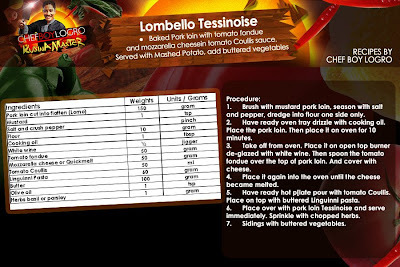 Here's Kusina Master Recipe- Lombello Tessinoise. Baked pork loin with tomato pandue and mozzarella cheese in tomato coullis sauce. Served with mashed potato and add buttered vegetables. 1. Brush with mustard pok loin, season with salt and pepper, drege into flour one side only. 2. Have ready oven tray drizzle with cooking oil. Place the pork loin. Then place it on oven for 10 minutes. 3. Take off from oven. Place it on open top burner de-glazed with white wine. Then spoon the tomatoe fondue over the top of pork loin. And cover with cheese. 4. Place it again into the oven until the cheese became melted. 5. Have ready hot plate pour with tomato coullis. Place on top with buttered Linguinni pasta. 6. Place over with pork loin Tessinoise and serve immediately. Sprinkled with chop herbs. 7. Sidings with buttered vegetables. 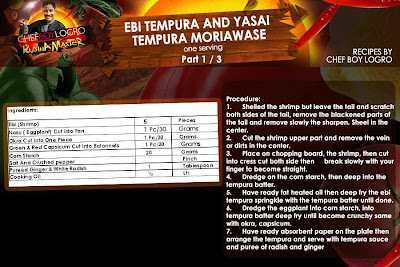 Here's Kusina Master Recipe- Ebi Tempura and Yasai Tempura Moriawase. 1. Shelled the shrimp but leave the tail and scrathc both sides of the tail, remove the black end parts of the tail an remove slowly the sharpen. Sheel in the center. 2. Cut the shrimp upper part and remove the vein or dirts in the center. 3. Place on chopping board, the shrimp, then cut into cress cut both side then break slowly with your finger to become straight. 4. Dredge on the corn starch, then deep into the tempura batter. 5. 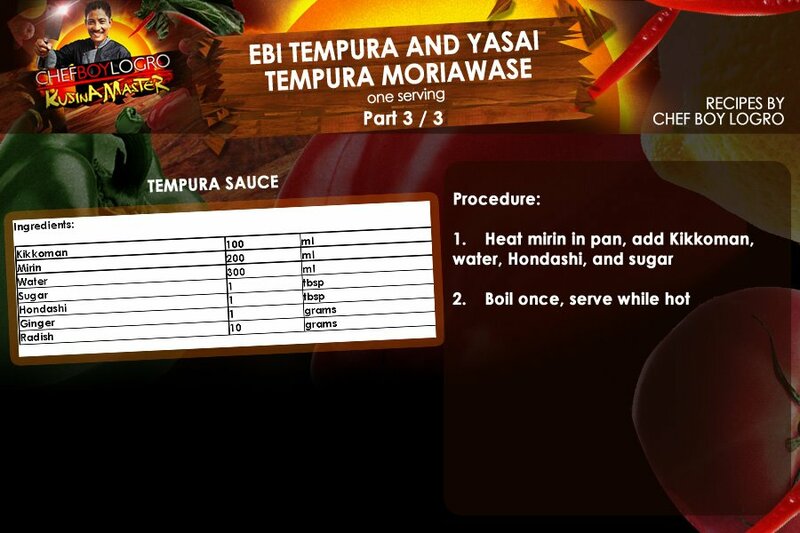 Have ready fat heated oil then deeply fry the ebi tempura sprinkle with the tempura batter until done. 6. Dredge the eggplant into cornstarch, into tempura batter deep fry until become crunchy, same with okra, capsicum. 7. Have ready absorbent paper on the plate then arrange the tempura and serve with tempura sauce and puree of radish and ginger. 1. 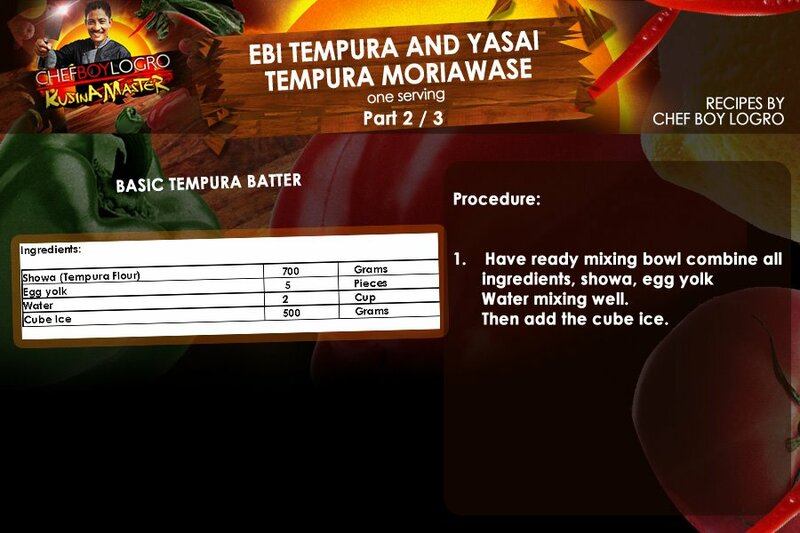 Have ready mix bowl combine all ingredients, showa, egg yolk, water mixing well. Then add the cube ice. 1. Heat mirin in pan, add Kikkoman, water, Hondashi and sugar. 2. Boil once, serve while hot. 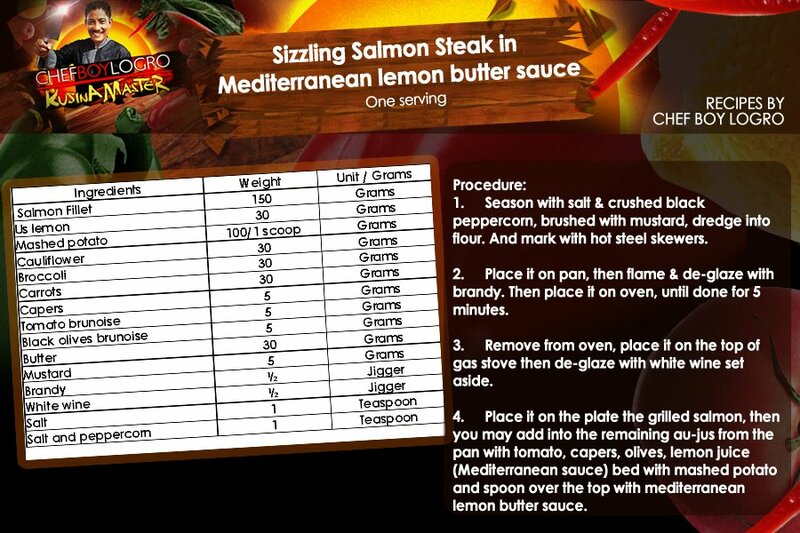 Here's Kusina Master Recipe- Sizzling Salmon Steak in Mediterranean Lemon Butter Sauce. 1. Season with salt and chrushed black poeppercorn, brushed with mustard, dreged into flour. And mark with hot steel skewers. 2. Place it in a pan, then flame and de-glaze with brandy. Then place it on oven, until done for 5 minutes. 3. Remove from oven, place it on top of stove then de-glaze with white wine set aside. 4. 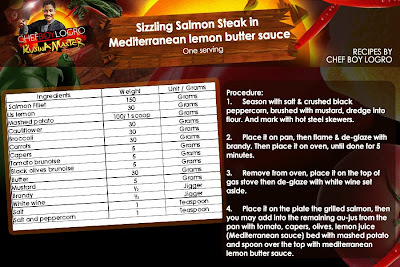 Place it on the plate the grilled salmon, then you may add into the remaining au-jus from the pan with tomato, capers, olives, lemon juice (Mediterranean sauce) bed with mashed potato and spoon over the top with mediterranean lemon butter sauce. 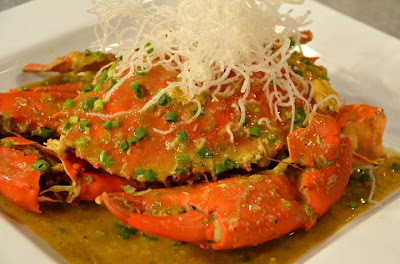 Here's Kusina Master Recipe- Langostinos ala Pobre Sauce. 1. Pan grilled with oil, and then seasons the prawns in salt, pepper, mustard, into pan. 2. Place it on oven for 5 minutes, de-glaze with brandy then place it on gas flame. De-glaze with white wine. 3. 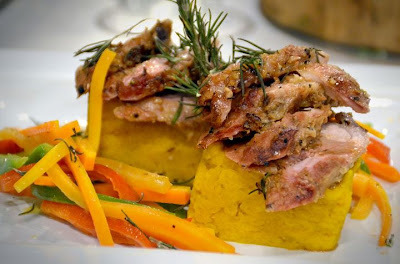 Have ready mashed potato into the plate then arrange the Langostinos then garnish with garlic chips and vegetables and lastly is the remaining sauce of lemon butter sauce. 4. On top with mango salsa, just before serving. Watch Kusina Master: Jan. 20, 2012 episode as Kusina Master- Chef Boy Logro prepares Fish with Tausi. 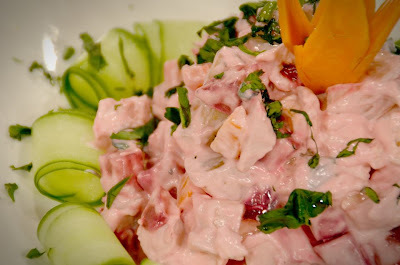 Here's Idol sa Kusina Recipe for Episode 27 / Jan. 15- MANGO SHRIMP POMELO SALAD. 1. Blanch skewered shrimp into boiling water with salt and lemon slice for 2 minutes. 2. Remove from boiling water and peel off shell but leave tail. 3. Cut into butterfly then place on cloth or absorbent towel and set aside. 4. Chop half portion of shrimp and combined pickle relish, pimientos, celery, walnut, mayonnaise, Tabasco, salt and white pepper. Set aside. 5. Place on round mold. Slice French bread and bake in oven until crunchy. 1. Puree peeled ripe mango. Pour olive oil and mix together by using wire whip, until creamy. A drop of US lemon to taste, a little salt and pepper. 2. Place on center of salad plate the crunchy round French bread filled with Lolo Russo lettuce. 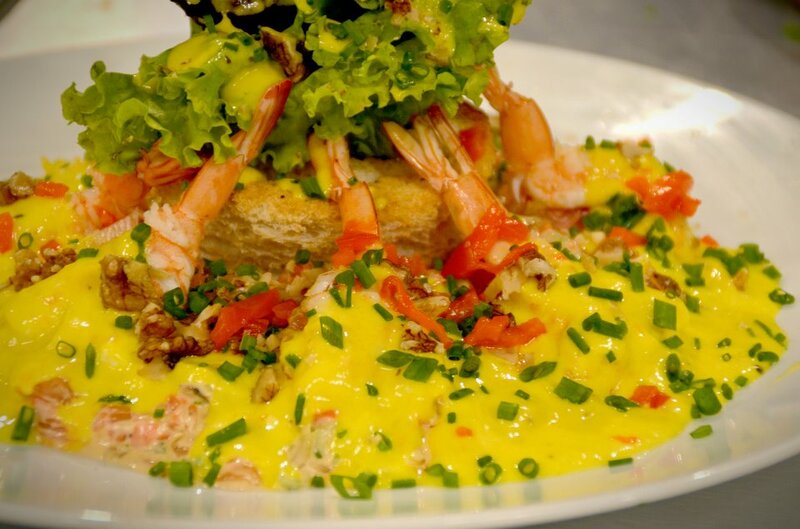 Then place on both side with Quenelle Shrimp mixture, over the top with Pomelo wedges and butterfly shrimp. 3. Pour mango dressing. Sprinkle with chopped spring onion, tomato, walnut, just before serving. 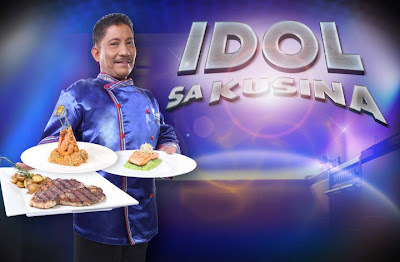 Here's Idol sa Kusina Recipe for Episode 27 / Jan. 15- TOMATO WATERMELON SALAD WITH ROASTED CASHEW AND KESONG PUTI. Procedure:1. Carve into basket the whole watermelon and remove all watermelon meat inside and cut into chunks and set aside. 2. Combine tomato, watermelon, kesong puti, arugula, fresh basil and toss in bowl with Balsamic vinegar, extra virgin oil and honey. Season with salt and pepper. 3. 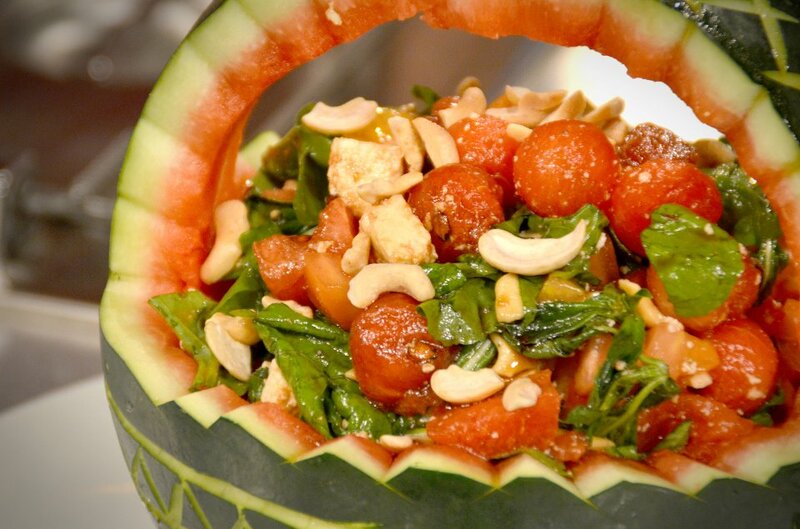 Fill carved watermelon basket with combined mixture of melon, tomato, kesong puti, and arugula. Top with roasted cashew nuts. 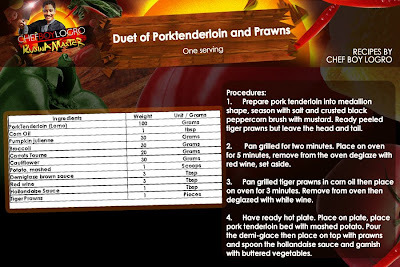 Here's Kusina Master Recipe- Duet of Pork Tenderloin and Prawns. 1. Prepare pork tenderloin into medallion shape, season with salt and crusted black peppercorn brush with mustard. Ready peeled tiger prawns but leave the head and tail. 2. Pan grilled for two minutes. Place in oven for 5 minutes, remove from the oven deglazed with red wine, set aside. 3. 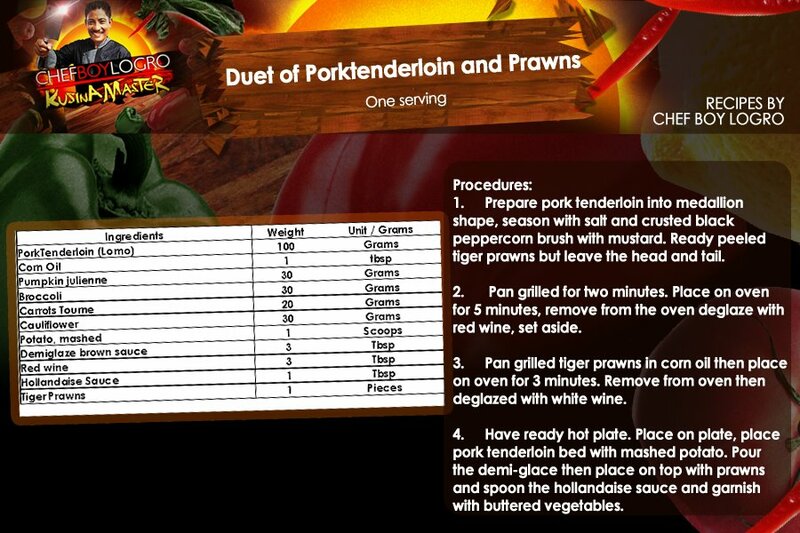 Pan grilled tiger prawns in corn oil then place in oven for 3 minutes. Remove from oven then deglazed with white wine. 4. Have ready hot plate. Place on plate, place tenderloin bed with mashed potato. Pour the demi-glace then place on top with prawns and spoon the hollandaise sauce and garnish with buttered vegetables. 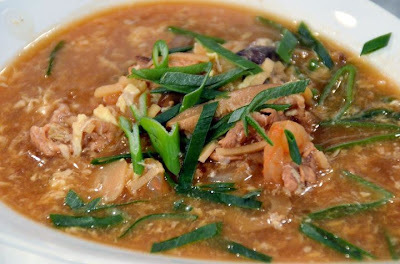 Watch Kusina Master: Jan. 18, 2012 episode as Kusina Master- Chef Boy Logro prepares Assorted Mushrooms with Tofu. 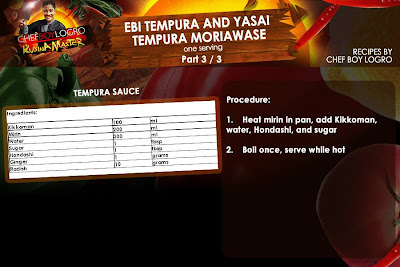 Watch Kusina Master: Jan. 17, 2012 episode as Kusina Master- Chef Boy Logro prepares Chicken Yakitori. Watch Kusina Master: Jan. 19, 2012 episode as Kusina Master- Chef Boy Logro prepares Mango Kerabu. 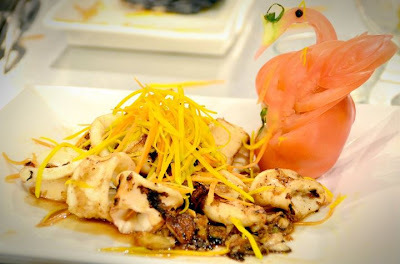 Here's Idol sa Kusina Recipe for Episode 26 / Jan. 8 PAN GRILLED SQUID TEPPANYAKI. 1. Remove skin of squid. cut into four then cut slowly to cress cut. Set aside. 2. On hot teppanyaki table griller, pour olive oil. Place squid, turn very quickly for 2 minutes. Flame with brandy. 3. OIn one side of teppanyaki table, sauté garlic and onion until brown, then mix together. Add butter, soy sauce, lemon juice, wine, and sake. 4. Place on plate and garnish with carrots and pumpkin and spring onion. Kusina Master- January 13, 2012- ISKARGU! Watch Kusina Master- January 13, 2012- ISDA + KARNE + GULAY = ISKARGU! 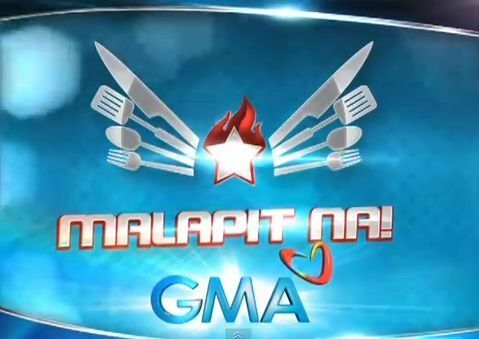 Televiewers will have another reason to enjoy a sumptuous lunch everyday as GMA Network brings “Kusina Master,” an informative and entertaining daily cooking program, beginning January 2, 2012. Attend the Weddings & Debuts 2012 Bridal Fair. For more info, just follow the link: Save the dates-Feb 17, 18, & 19, #BridalFair2012! 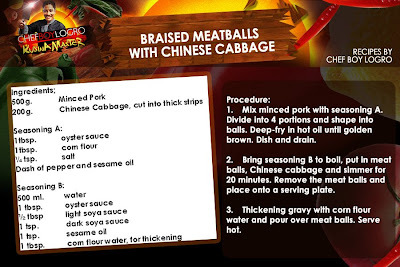 Watch Kusina Master: Jan. 12, 2012 as Chef Boy Logro prepares Meatballs with Cabbage with celebrety guests, Party Pilipinas divas' Rachael Ann Go and Kyla better known as ShinKy. 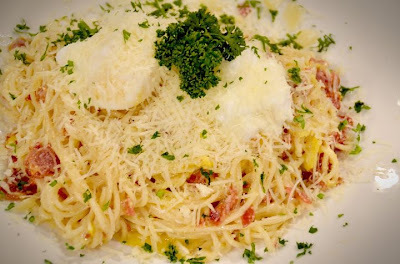 Here's Idol sa Kusina Recipe for Episode 26 / Jan. 8- BACON CARBONARA WITH POACHED EGGS. 1. Poach eggs and set aside. 2. Fill large soup pot with cold water and add handful of salt. Stir and taste; it should taste like seawater. Cover pot and heat water until it boils. 3. Add diced bacon to a cold sauté pan and cook slowly over low heat for 10 to 15 minutes or until crisp. Remove bacon from pan and drain on paper towels. 4. Drop spaghetti into boiling salted water and cook according to package or until al dente, or tender but still firm to the bite. 5. While the pasta cooks, melt butter in pan with olive oil, combine cheese, and cream. Add dash of nutmeg and simmer. Season with salt and pepper. 6. Drain pasta, toss with cream mixture, then add cooked bacon and chopped parsley. Toss and serve right away, with additional grated cheese if desired. 7. Top with poached eggs. 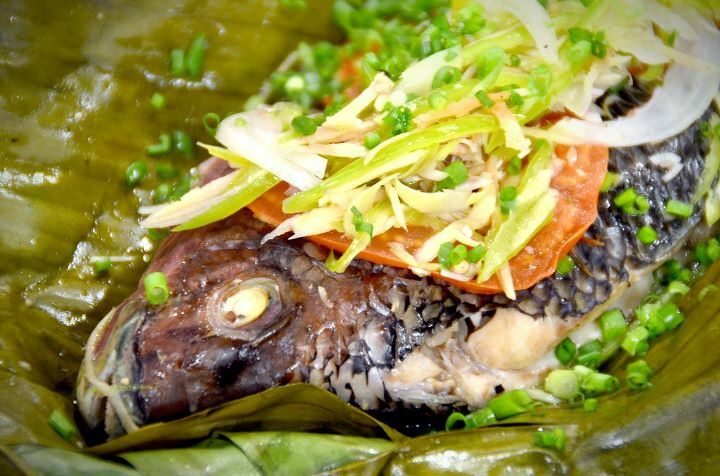 Here's Idol sa Kusina Recipe for Episode 26 / Jan. 8- STEAMED TILAPIA IN BANANA LEAVES. 1. Season tilapia with salt, pepper, calamansi juice. 2. Lay banana leaves on chopping board. Drizzle with olive oil. 3. Fill inside half portion of ginger, garlic, red onion, green chili, tomatoes, lemon grass. 4. Place on top remaining half portion of ginger, garlic, red onion, green chili, tomato, lemon grass. Season with salt and pepper and drizzle with olive oil. 5. Wrap with banana leaves, then place in steamer for 1 hour or until done. 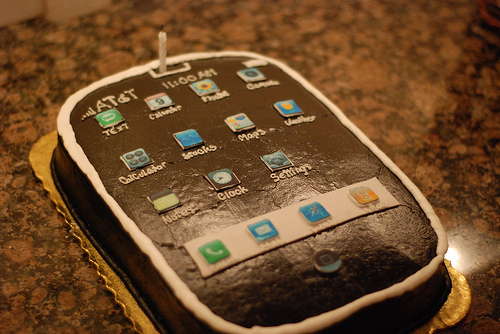 Here's a Birthday cake for iPhones 4th year birthday.